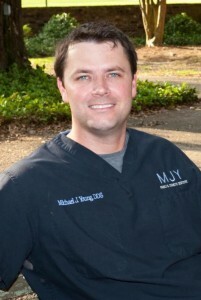 Dr. Michael Young is dedicated to forming relationships with each of his patients. At our Lafayette dentist office, our team will take time to meet with your family and discuss your needs and desires so we can build a bond based on trust and understanding. In return, we would like you to get to know the backgrounds, personalities, and qualifications of your Lafayette dental team. Take this quiz to see how much you know about Dr. Young. 1. Where did Dr. Young receive his dental degree? 2. How did Dr. Young develop his work ethic? 3. How did Dr. Young spend the first two years of his dental career? 4. What year did Dr. Young open his Lafayette dental facility? C. Dr. Young began studying basic sciences and nursing at LSU Eunice, but later moved on to LSU Baton Rouge to study biochemistry with the intent of applying to dental school. In 2003, Dr. Young received his doctoral degree in dental sciences from the LSU School of Dentistry. A. Dr. Young is a long-term resident of the Lafayette area. He developed his business sense by “running the traps” in family crawfish ponds. B. After receiving his dental degree, Dr. Young spent two years as an associate dentist at other practices. During this time, he took continuing education courses in implant and cosmetic dentistry to further his training. A. Dr. Young opened his state-of-the-art dental office in Lafayette in 2005. Since then, he has been providing patients with quality care, the latest technology, and a range of restorative and cosmetic dental services to give patients healthy and beautiful smiles for life. Creating a relationship with Dr. Young will help you feel confident about the dental care you’re receiving. To meet your Lafayette dental team, call (337) 237-6453 to request an appointment at our Lafayette dentist office.